Other tips and tricks are featured underneath this box. This page, written by a grad student, gives first-hand advice about how to go about writing a review article for the first time. It is a quick, easy read that will help you find your footing as you begin! Reviews are usually published by experts in the field. Being familiar with the structure and purpose of reviews will help you navigate scientific literature more confidently, but remember that it is not likely you will be writing a review for publication in a journal until well into your career. Sometimes, journal editors will invite scientists to write a review for their journal. If you need to write a review article but don't know where to start, keep some of these tips in mind. Pick something you're interested in and that you have experience researching. A review is meant to be a survey of the current state of a field - and the less you know about a field or topic at the outset, the more work you're going to have to do in order to have an authoritative voice that can provide insight about the research that has been done. Choose a topic that will be interesting to others whether it's currently receiving a lot of attention, it's a controversial topic, or it's in a well-established field. 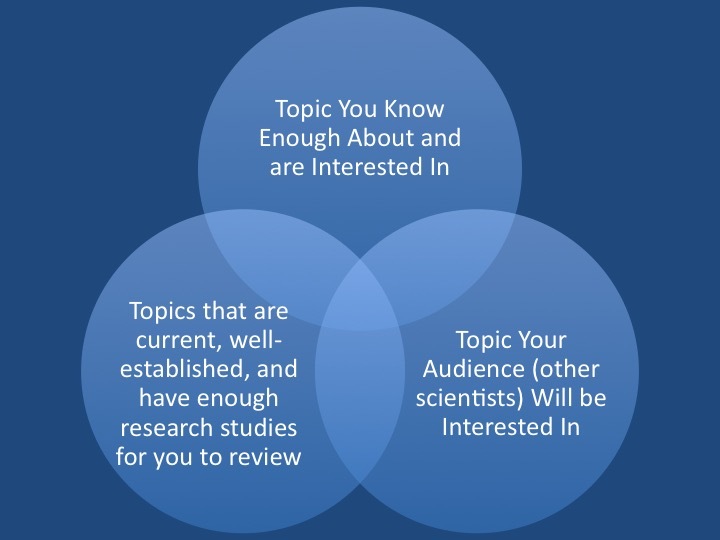 You want to contribute to the knowledge base and understanding of other scientists so make sure it centers around a topic that has a good-sized audience! What is the thesis or problem being addressed in this paper? What are the strengths and limitations of the study? Is there a better way to answer the research question? How does the author approach the study - from a theoretical, experimental, interpretive, or clinical (etc.) standpoint? Did they choose the best approach? Is the author using an assumed theoretical framework such as, for example, psychoanalytic or developmental? How does this affect the conclusions they draw? How does the author engage with other literature in the field? Is literature that both contradicts and supports his/her findings mentioned? Did the researchers choose appropriate methods of experimentation and data analysis for the research question? Do you think that the conclusions they draw based upon the data they present are valid and reasonable? Or are there gaps in the logic or assumptions being made? Does this particular research study contribute to the knowledge base of the field around which you're centering your review? Is it worth including in your discussion, and does it fit your main thesis? Adapted from the UCLA Undergraduate Science Journal. Wrap up your review by drawing everything together and making sure it is clear what conclusions you draw about your topic or field of study based on the research studies you read and analyzed. This paper is all about the references! Cite everything that you discuss. For tips on when and how to cite, visit the next page on the drop-down menu under "Writing in the Sciences!"